A new system for matching potential parents with children awaiting adoption has turned out to be significantly more effective than traditional methods. The well-known Russian TV program “Poka Vse Doma” (While Everyone’s still at home) is about to celebrate its 20th anniversary. Over the years, the show has expanded to include a series called “U vas budet rebenok” (You are going to have a child), which was the idea of the presenter Timur Kizyakov and his wife Yelena. Together they developed a new way of matching potential adoptive parents with children in orphanages all over Russia. The first step in the process is for both sides to make professionally produced mini-films, or “video passports,” as the show calls them, which are then put on a searchable database. Kizyakov spoke to Anastasia Reznichenko of Itogi magazine about adoption and the success of his project. Itogi: where did the idea come from to make a series about adoption? Timur Kizyakov: Five years ago, we decided that the original format of Poka Vse Doma could be expanded. Instead of just talking about family happiness, we thought the show could become instrumental in building new happy families. My wife Yelena and I are parents ourselves and we could see that a well-loved TV program with a huge number of regular viewers could really help children who were looking for foster families. As soon as the program was aired, we got a massive response, and we could see that it had really struck a chord with the Russian public. This dispelled any initial doubts we had about whether such a harrowing theme was really appropriate for a program about family life. Every time we showed a clip of a child’s video, adoption agencies in that particular region would receive dozens if not hundreds of calls. Of course every potential adoptive parent was very carefully screened, but the best thing about all this was that there were always many more children without homes in that region than the one case we had featured, so couples hoping to adopt could then find other kids living in other local orphanages. On one of the programs we showed a film about a little girl whose parents had been killed in an accident, and she herself had lost the fingers on her hand. We got a huge response; the little girl was taken in by a couple who were not at all put off by her disability. And then we got another call – this time it was from doctors in St. Petersburg who were also willing to help. Without asking for any payment, they performed a complicated operation to replace her fingers, and the little girl is now doing very well. But for us, the most important thing was that she found a family. Itogi: The series has expanded and now you are developing a searchable database for people hoping to adopt. How complicated is this work? T.K. : In our film, we aim to present the child as he or she really is, and we want potential parents to like what they see. This requires a lot of hard work on our part, as we don’t want to miss anything. It takes around 40 hours to make a video passport for one child, and this is done by a team of 30 people. The team helping the child have very high standards - potential foster families who come to the orphanage are vetted very carefully; no detail of their appearance goes unnoticed. An orphanage is a place where emotions run high, and when we are there we have to tread very carefully. 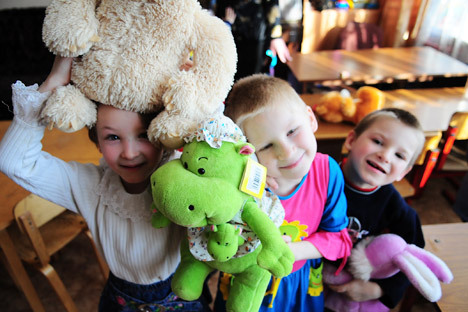 The films, along with information about the children, are all available in local adoption agencies, and anyone who is interested can find them online at www.videopasport.ru. Some couples prefer to adopt a child from an orphanage far away from where they live, so there is less chance of coming across the child’s biological parents, and we fully respect this wish. The regional authorities can access the films free of charge and show them on local TV. Our system means that when potential parents eventually get to the top of the waiting list and are invited to adoption agencies, they are not forced to go through the trauma of hurriedly looking through a list of kids awaiting adoption and have to make a rushed decision – instead, they take home a DVD featuring short demo-versions of each of the child’s video passports, and watch it in their own time. Couples can then come back to the agency and ask for the full video passports of the kids that caught their attention. On our website and also on the discs we give out, the children have profiles presented in a format resembling a flower. In the center of the flower there is a photograph, and each petal is a link to various different information about the child, divided into sections such as “My video,” “My achievements,” “What I like,” and so on. People can click on the petals in any order, but we figured that they are most likely to go around the flower clockwise, and so we put the “my health” section last of all. This was done deliberately so that a person looking at the child’s profile will already have found out a lot about the child, perhaps even formed the start of an attachment to him or her, and this would mean that any health problems are less likely to matter; the idea is that the potential parent would feel sympathy for the child having found out what he or she is like. Itogi: Would you say your work has paid off? T.K. : Since we started the project, we have made approximately 500 video passports, and helped find a home for more than 800 children awaiting adoption. At the moment there are still 100 video passports that have been blocked on the Internet – this means that these kids are currently getting to know potential adoptive parents. Our video passports have an 80 percent success rate, and a large portion of the children who are now living with families were above the age of seven when they were adopted. According to Russian statistics, the likelihood of school-aged children finding a foster family is only 8 percent. Itogi: By now you are probably an expert on the problems of adoption. Can you tell us something that you have learned? T.K. : Over the years I have had dealings with a lot of adoption specialists, and it has been a steep learning curve for me. For example, I now know that if after a month of living in the new house, following huge effort on the part of both the new parents and the child, the situation is going well, the child’s behavior may start to go dramatically downhill, or he or she may start doing badly at school. And this is the completely normal reaction of a psychologically healthy person. When the new parents understand that after the honeymoon period they should expect a tough period where the child has to adapt to the new situation, they are less likely to panic, and they can even regard difficult times as a positive sign. I think the most important thing is that everyone is very well informed about the adoption process and knows exactly what to expect. This was actually why we decided to make videos, to help prepare the foster parents for what lay ahead of them. We have filmed 20 lessons, and each one is an hour long – that’s 20 hours of preparation. This year we are going to make another 15 video lessons, because 20 hours was not enough time for us to include everything we wanted to say. Not many people are aware of the terrifying statistics about how many Russian foster children end up being returned to an orphanage. At first, couples seeking to adopt are often overwhelmed by a feeling of pity for the child, but the decision to bring up an orphaned child should not be the result of sympathy alone. Pity for the child could one day turn into pity for yourself. And then the child will become a burden that you will want to rid yourself of. You will send him or her back to the orphanage, and think up a million justifications for what you have done. Often a person’s love for a child will be based on a delusion. I expect you can you imagine how photobanks of appealing young children awaiting adoption could be quite misleading. The main problem here is that a grown-up can get carried away with emotions just by looking at one photo of a child, and the new parent may start imagining an idealized image of family life. But the children cannot be expected to live up to this idealized image, and the child is the one who normally bears the brunt when parents are hit by the reality of the situation. The photobanks often have insufficient detail to be able to give a truthful picture. The pictures of the children are so small that you can hardly make out their features. And underneath are a few details about him or her: “Eyes: blue”, “Character: kind, sociable.” Adoption is a very serious business, and a superficial approach can do a lot of damage. First published in Itogi magazine.